After church sue and I drove over to see my son David and his fiancée Renee in Wagoner. They are remodeling his house and needed us to inspect the work. 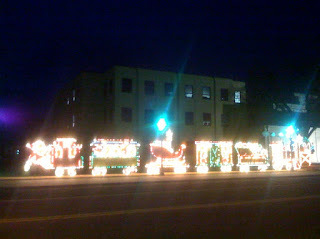 On the way back we drove through the downtown section to admire the Christmas decorations. In small towns like Wagoner concern for political correctness does not prevent Santa's appearance in seasonal decorations on the court house lawn. 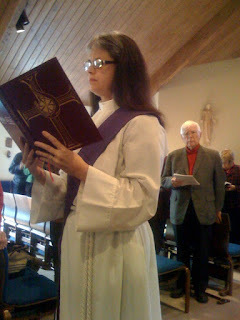 Advent spans the four Sundays preceding Christmas. It is a time of waiting and watching, a time of preparation. The gospel today is from Mark 13, "you do not know the hour when the master will come". The Saturday after Thanksgiving is the traditional day for college football rivalries. We are watching Oklahoma play Oklahoma State and of course Smokey is watching too. 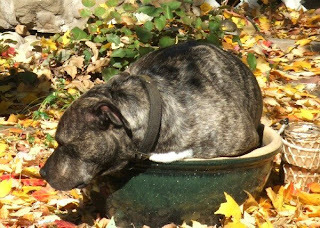 Why would Smokey decide to sleep in a flower pot? 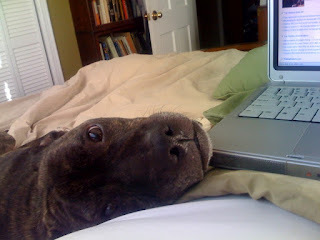 I don't know, but he's a big dog. He sleeps where ever he likes. 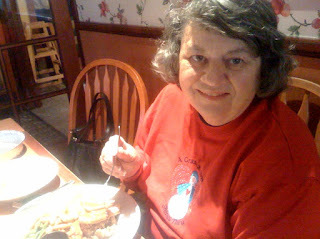 Sue he planned to cook a turkey and make a nice dinner thinking her mother would be with us. Unfortunately, Marjorie fell last week and when she was released from the hospital Sue had to move her to a nursing home to receive more attention. Since it just the two of us we took the easy way out and went to a restaurant. It was good but I will miss the leftovers. In 1966 I was married on Thanksgiving Day and we celebrated our anniversary on Thanksgiving regardless of the date. Over 25 years we had 4 children and a lot of good times. Regretably my social drinking became rather unsociable and we finally parted company. While this was difficult it motivated me to join AA and get sober. Now I find myself married to a nice lady who only knows me sober. I got to start over. We love each other and are very happy in our little house. I have a lot to be thankful for on this Thanksgiving day. 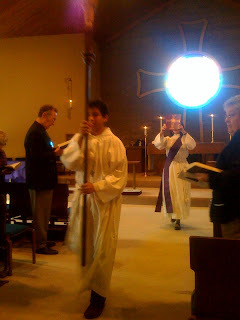 We enjoyed a joint Lutheran-Episcopal Thanksgiving service tonight at Joy Lutheran. 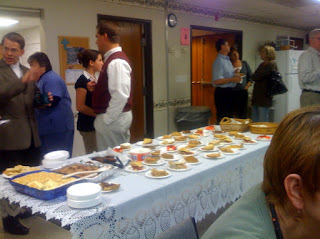 The service was nice and the pie table spectacular. 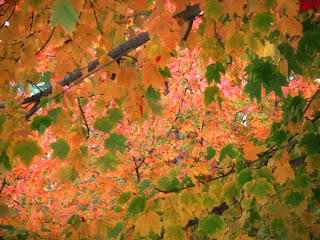 I should apologize for yet another picture of my maple trees but really I wanted to share with you our beautiful weather. We are enjoying a clear blue sky with not a cloud in sight and a calm 59•F (15•C). Perfect weather! Here comes Susan with a cart full of goodies for our Thanksgiving holiday dinner. 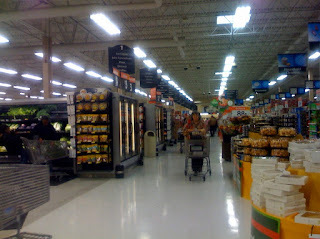 The Walmart is our "horn of plenty". Thanksgiving Day is the 4th Thursday in November and that is just 4 days away. Roast turkey and all the trimmings and the leftovers are the best part. 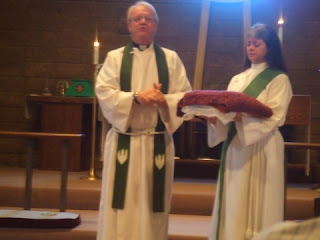 Father Rick and Deacon Nancy blessing some gifts to the prayer ministry. 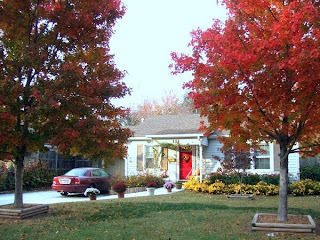 Here are my maple trees from the other side. I planted these about 8 years ago and they are doing very well, despite an ice storm last December and a wind storm in March. The tops are a bit ragged but they are making a good effort. 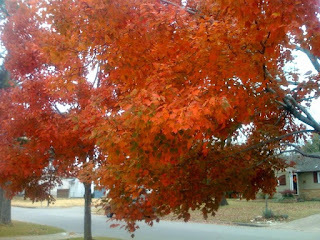 I like it when the leaves are different colors on the same tree. 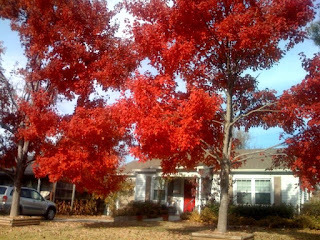 The Maple trees in my front yard are looking really nice. They turn late. 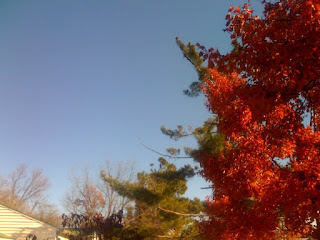 Most of the trees in the neighborhood are getting bare. 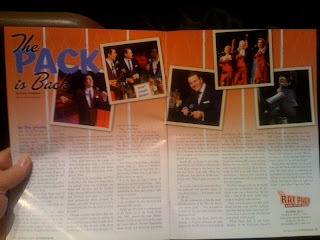 The impersonators are close if not dead on, but a good show In it's own right. Sorry no good photographs but cameras not allowed during the performance. A lot of these folks are from the UK it turns out. Nice job, very professional. These are nice seats down in the orchestra section. The view is different from down here. 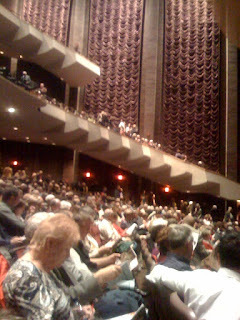 Our TSO tickets are in the upper balcony. We have good friends who were not able to attend a performance tonight so offered us their tickets. Nice friends! 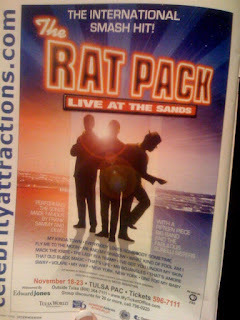 The Rat Pack of course was Frank Sinatra, Dean Martin, and Sammy Davis Jr. This "tribute" performance also has an Andrews Sisters singing trio. 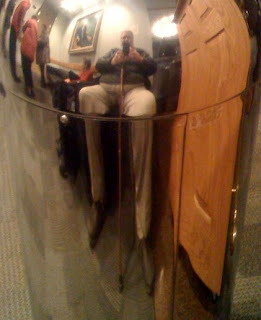 Waiting for sue I enjoy my reflection in a chrome waste can. It makes my cane look very long. 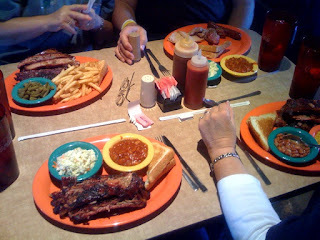 Oklahoma barbeque is meat smoked at fairly low temperatures for a long time ( (250•F for 5 to 6 hours) - low and slow. It is falling apart tender, very moist, and has a wonderful smokey flavor. Runt's does a good job, but mine is better. Sauce is added at the table if desired. Classic sides are baked beans, cole slaw, and large glasses of iced tea. Are you getting this Renny? Oklahoma is a very conservative state and voted 62% for McCain. 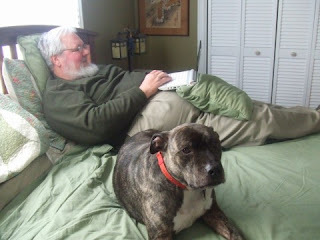 We and our friends Robbie and Worth are staunch democrats, and were jubilant when Obama won handily. We decided to celebrate with barbeque, a dish that we understand Mr. Obama also enjoys. 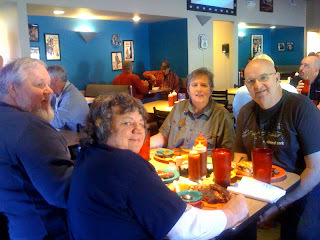 We ate at Runt's. Here is little Grant all dressed up for his Christmas pictures. He does not seem overly excited. We hope to get the result from the professional photographer soon. Gavin is the son of our friends Mike and Amber. SInce Mike is like a son to me, Gavin qualifies as a grandson. At 20 months he is getting to be a big boy. 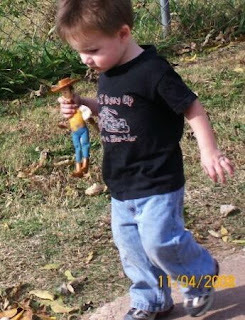 Woody is his favorite toy. 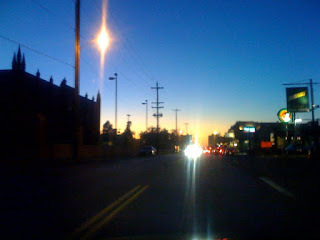 Just east of Peoria on 15th Street. 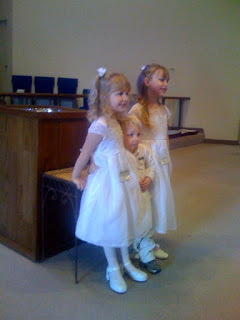 The Manering children looking exceptionally angelic. 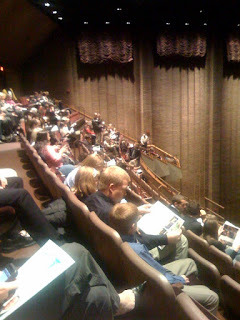 We are in the last row of the upper balcony. It's a long way up here but the acoustics are great. 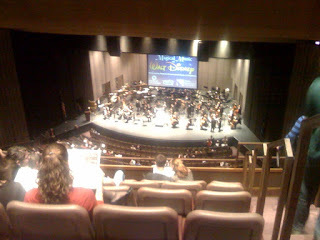 It's intermission and the Disney theme music has been "nice". Oh well, I am kind of a snob about my music. Sue is enjoying it and a lot of people have brought their children and I'm sure they like it. We will stop on the way home for pie and coffee and it will be a nice evening. 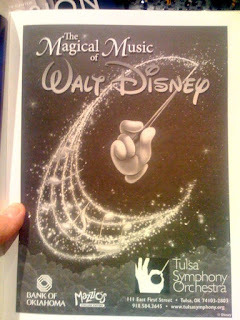 Tonight's offering is "The Magical Music of Disney", a selection of theme music from a variety of Disney movies. This might not be my first choice for a playbill but with season tickets we take what is offered. Kind of like mother's home cooking. 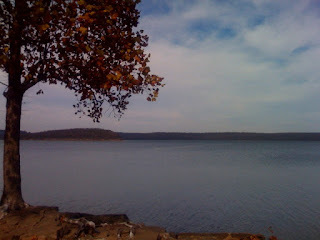 We are home again after our little escape to the cabin on Tenkiller. For those who expressed an interest in Native American or First Nations culture, I invite you to look at some photos from a Powwow we took two of our grandchildren to see last July. The Tulsa Powwow is a gathering of all interested tribes to enjoy traditional dance and song. The costumes are very beautiful and the dance competition very exciting. I hope you enjoy. Nous sommes de retour à la maison peu après notre échapper à la cabine sur Tenkiller. Pour ceux qui ont exprimé un intérêt dans des États-Unis ou la culture des Premières nations, je vous invite à regarder quelques photos à partir d'un Powwow nous a pris deux de nos petits-enfants pour voir Juillet dernier. 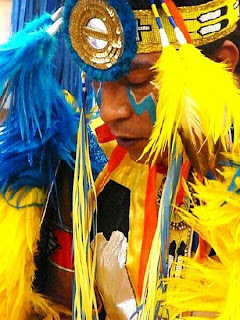 Le Powwow Tulsa est un rassemblement de toutes les tribus de jouir de la danse traditionnelle et du chant. Les costumes sont très beaux et les concours de danse très excitant. J'espère que vous aimerez. 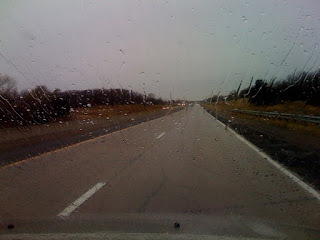 Rain on the way home. After enjoying beautiful weather for our outing we get rain. Perfect timing! 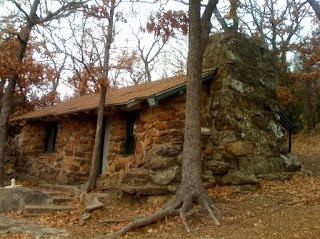 Greenleaf has these wonderful cabins made of native stone. They look very much like the home for a Hobbit except for the lack of a round door. We will come back and spend a few days here another time. 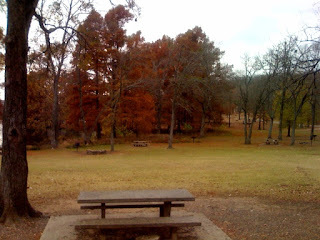 On the back we detoured through Greenleaf state park. Sue had not been there before. 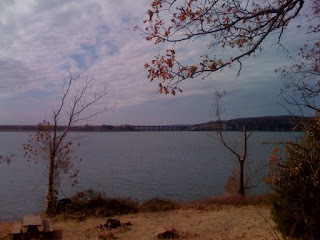 A last look at the lake with the dam in the distance. Click to enlarge. We have had a nice escape from our routine. Smokey liked it. 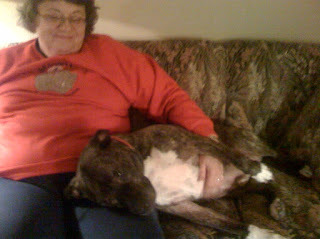 Susan has fed us eggs and toast and we are ready to start back. 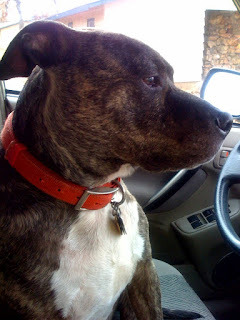 Smokey is ready to go and would like to drive but we have to remind him that he doesn't have a license. Our cabin is very comfortable with kitchen and bath. 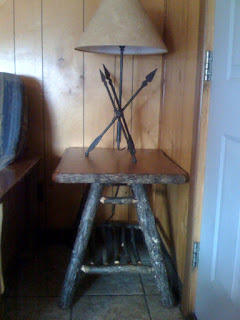 The furniture is sturdy and rustic, appearing to be made from local trees. the bottom where the red arrow points. The gift shop. 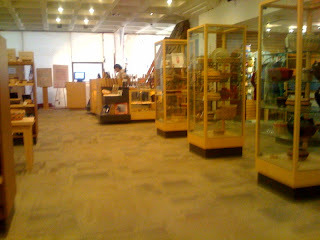 Along with the usual knink knacks were some very nice artisian crafts and really interesting books. I bought a reprint of a 1900 collection of "Cherokee History, Myths, and Sacred Formulas". It is thick and looks fascinating. 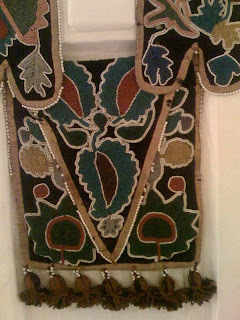 Another fully beaded bag from the 1800's. 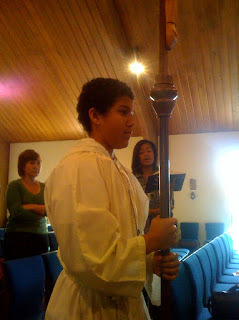 These were for special ceremonies. Click to see more detail. The beads are very small. 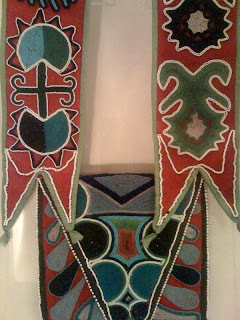 This fully beaded bandolier bag dates from 1820. 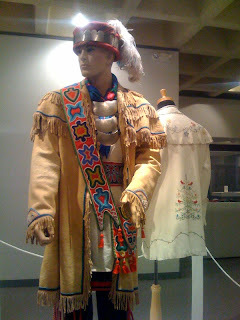 On display is a special exhibit of traditional bead work. What was almost a lost art has recently been revived. Some of these pieces are very old and some are new. 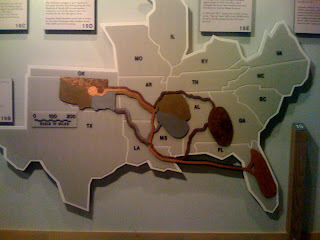 Those Cherokee who did not willingly relocate were forcibly removed in 1838. Traveling on foot many died along the way. 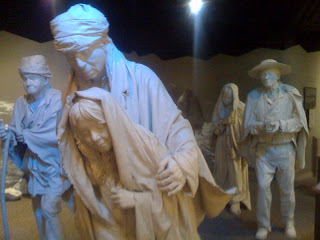 Recalled as the "Trail of Tears" this is depicted with lifelike statuary. 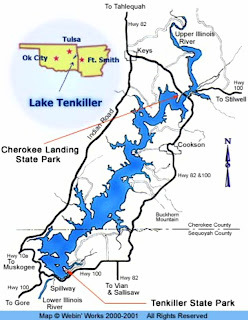 Finally in 1835 the Cherokee along with other tribes were assigned land far to the west in what became known as Oklahoma Indian Territory. 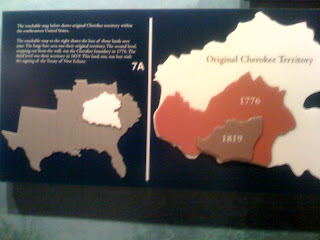 The Cherokee people at one time controlled a large area in the eastern part of what is now the United States. As European settlers demanded land, several treaties were signed compensating them for land and the tribal area was reduced. interesting museum and cultural center. 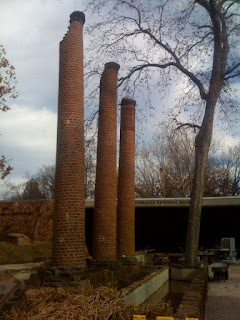 The 3 brick columns at the entrance are all that are left of the original Female Cherokee Semenary that burned in 1887. I have a photograph of my grandmother and great aunt as school girls there. There is a great deal of interesting history depicted here. I would like to tell more but it is tedious keying text on an iPhone. I will mostly share pictures now and add more text after we return home. 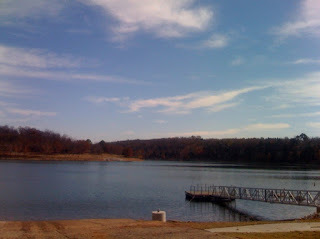 Years ago I had a 2-person kayak that we enjoyed here. We have good weather today. Tomorrow may be rain. A good place to fish. 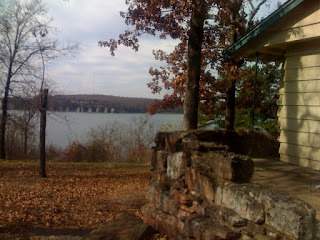 Here is a morning view of lake Tenkiller and our little cabin. We are exploring for nice views. 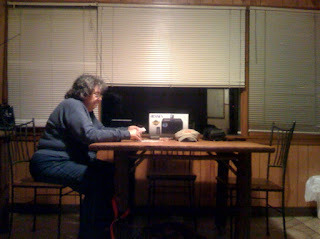 Susan relaxes with a game of solitare. I am about to challenge her to a game of Gin Rummy.